January Jones at the Emmys. If you’ve been on the fence about the return of the jumpsuit, seeing January Jones in her fabulous emerald jumpsuit on the Red Carpet at the Emmys on Sunday night, might just have you rethinking the look. Jumpsuits are very flattering on just about every shape, and they can be really comfortable to wear too. We’ve got a few picks today, in all price ranges and styles that can go from office to black tie. And read stylist Deborah Boland’s tips on how to wear the jumpsuit look. 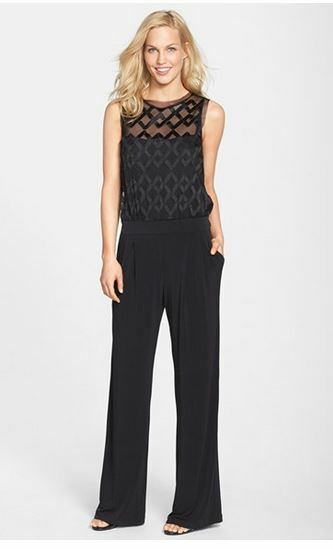 Julia Jordan Jersey & Mesh Jumpsuit – super comfy and elegant looking too. $168.00 Norstrom. MSK Women’s Jeweled Necklace Halter Jumpsuit. 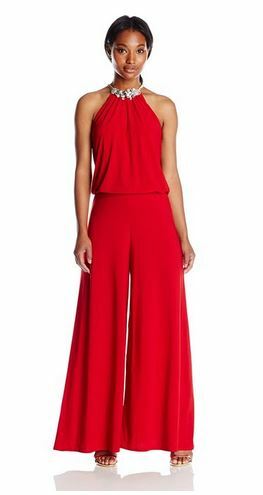 Love the color of this jumpsuit and the jeweled neckline make it a great evening wear juice. And get this, it’s just $69.00 at Amazon.